The proportion of women in the workforce is increasing each year. By 2010 a full one-third (33.3%) of women were working compared to 29.9% in 2000. According to 2010 census data, the rate of economic participation of women is very closely linked to community size. In urban areas of over 100,000 population over 41% of women work. The percentage is 36% in cities with populations 15,000 to 100,000 and 29% in towns from 2,500 to 15,000. In rural areas, communities of under 2,500 inhabitants, the figure is 17%. These official census figures do not count all the unpaid work women do in households, on farms and in family-operated enterprises. For this reason, these census figures paint a very inaccurate picture of the contribution that women make to the Mexican economy. A recent OECD (Organization for Economic Co-operation and Development) report found that Mexicans work an average of 10 hours a day, longer than people in any of other OECD member country. (The average for all OECD members is 8 hours a day.) These figure include both paid and unpaid work such as housework. The figures show the importance of home and family in Mexico—the report points out that Mexicans also do the most work in the home (3 hours a day), mainly preparing meals. Just how important to the economy is all this unpaid work? The OECD report estimates that the total value of unpaid work is equivalent to a whopping 24% of Mexico’s GDP. Women are responsible for a large proportion of this unpaid but valuable contribution. The percentage of households headed by women is on the rise. It increased from 20.6% in 2000 to 24.4% in 2010. The pattern among states, however, is not easy to explain. The Federal District leads with 31.4% of households headed by women, but Nuevo León (which is second to the Federal District in most socio-economic characteristics) is at the very bottom with only 19.5% of households headed by females. Other states at the top of the list are Morelos (27.4%), Guerrero (26.9%), Veracruz (26.6%), and Baja California (26.0%). Other states near the bottom are Chiapas (20.2%), Coahuila (20.9%), Zacatecas (21.1%), Aguascalientes (22.4%) and Yucatán (22.4%). The percentage of households headed by women is influenced by many factors including widowhood, males or females migrating for work, and modernity with more young unmarried females living independently. The municipality of Aguililla, Michoacán, is closely linked to Redwood City, California, over 2900 kilometers (1800 miles) away. Redwood City has about 37,000 Latino residents, perhaps half of which were originally from Aguililla. 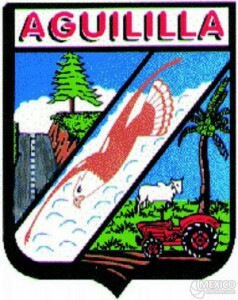 There are almost as many Aguilillans in Redwood City as there is in the municipality of Aguililla, which has about 25,000 residents. Aguililla and Redwood City are officially “Sister Cities”. How did this linkage form? Under the Bracero program many workers from Aguililla got temporary visas to work in California’s San Joaquin and Salinas valleys. Since agricultural work was seasonal, the immigrants looked for more permanent employment. A number found jobs in Redwood City, just south of San Francisco. Word spread to Aguililla relatives and friends in the Bracero program. They headed for Redwood City where they got assistance in finding jobs and homes from earlier Aguilillan migrants. Many returned to their hometown and soon everyone in Aguililla learned about the good jobs and good life in Redwood City. Before long there was a significant stream of workers leaving Aguililla headed for Redwood City. Many early migrants became permanent and moved their families. But they retained their ties to Aguililla and made return trips from time to time so their children could learn their roots and see their grandparents. The remittances sent back from workers in Redwood City have been important to the Aguilillan economy for over 60 years. This is an example of a migration channel which links two rather distant places. There are numerous migration channels between specific towns in Mexico and particular places in the USA. We look at other examples in other posts. The principle of distance decay suggests that the strength of links between settlements is usually inversely proportional to the distance between them (places close together, strong links; places further apart, weaker links). Migration channels cause anomalies in this pattern, since they often lead to strong spatial interactions which do not match those expected from distance decay. Can Mexico’s industry compete with China? Excerpts from Geo-Mexico Comments Off on Can Mexico’s industry compete with China? In recent years, Mexico has faced increased competition in world markets from China and other Asian countries. Mexico’s contribution to US imports peaked at about 12% in 2003 but has since fallen to around 10%. Chinese imports to the USA overtook Mexican imports in 2003 and now account for 15% of the total market. According to Mexico’s central bank, Mexico’s lost market share between 2001 and 2005 was worth $27 billion, equivalent to 15% of all non-petroleum exports. Some multinationals closed their assembly facilities in Mexico and moved them to China. The two most important ones are wage rates and the much larger local market. The average hourly wage for manufacturing in China is $0.66, compared to $2.13 in Mexico. China also offers more incentives for foreign investment. The companies that have moved are manufacturers of textiles, electronic items and auto-parts; these footloose industries do not have complex and expensive plants (unlike steelworks and chemical plants for example) and can therefore relocate relatively easily. While most have relocated in China, some have preferred South Korea or India. What are Mexico’s comparative advantages over China? Mexico’s major advantage is proximity to the US market. Shipping a standard 40-foot container from Mexico to the USA costs less than half the cost from China. Mexico also has a more educated workforce, with about one-quarter of the population having completed secondary education, compared to less than 17% in China. The productivity of Mexico’s workforce is slightly higher than in China, and the country also retains a slight edge over China in terms of its legal system. In an effort to stem the outflow of jobs, the Mexican government has opened several high-tech industrial parks, such as Silicon Border in Mexicali, and these appear to be having some success.